orientation, which is prohibited by California state law." grandchild of the former vice president and his wife, Lynne." Mariah Carey demands 20 fluffy white kittens, 100 doves, 80 security guards and more so she can turn on the Christmas lights at a London mall. South African runner Caster Semenya keeps title after gender dispute. Robert Pattinson can play things other than vampires. Incoming gay Detroit City Council member Charles Pugh talks of AIDS crisis in city: “There needs to be more money targets at the crisis areas." David Vitter won't comment on the Louisiana justice who refused to marry an interracial couple because he isn't familiar with Loving v. Virginia, the Supreme Court case which lifted the ban on interracial marriages. Demi Moore has lost a chunk of her thigh! WATCH: Band uses naked men as furniture in new video. Levi Johnston never intended to go full-frontal in Playgirl. 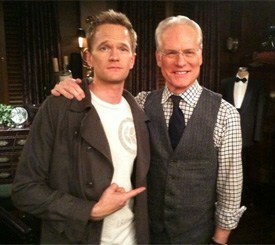 Neil Patrick Harris has a signature pose. Probably one of the skankiest beards in Hollywood. what Michelle Deferio was wearing. 'I was just making a gay joke,' he said. But friends saw him and joined in, standing with him and making signs of their own. Other students came and, by 6:30, there were about 70 people at the scene, holding signs, cheering and challenging the Deferios." If you were called "Mary" for 55 years would you really want your name changed to "Terry"? 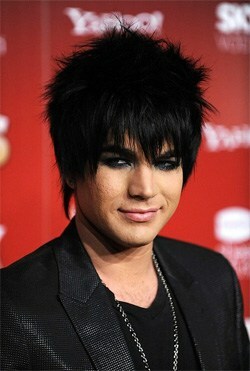 Adam Lambert is starting to resemble a member of the Queen's Guard. Gay vs Gay? Queer/trans anarchist group Bash Back protests Join the Impact demonstration in Minneapolis. A guide to D.C. marriage equality discrimination. Mall Santas and doctors neckties are to be avoided if you want to escape the flu. Via Boy Culture, Susan Boyle sings Madonna's "You'll See". UK pit bull owner hunted after allowing his dog to attack blind woman's seeing-eye dog. of Lutheran CORE and a retired ELCA bishop from State College, Pa."